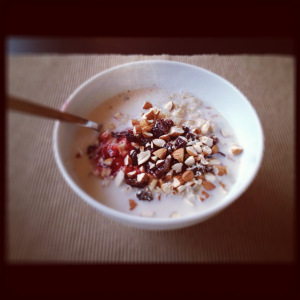 Gluten-free oatmeal topped with pepper/raspberry jam, raisins, chopped almonds, and a little almond milk. © Josefina Hellensberg. I’m always curious to find out what people, other than myself with similar dietary restrictions, have for breakfast. In Denmark, where I am from, the normal and very popular breakfast choice is a breakfast roll (usually white bread) topped with butter and cheese. Yeaaah, so since absolutely none of that works for me (you would probably struggle to find a more gluten and lactose heavy breakfast), I have had to think creatively.. This is a re-post from Josefina’s blog Restrictions Turned Creative where she offers tips and tricks on creative gluten-free and lactose-free eating. By sharing her delicious discoveries she hopes to help others successfully navigate a universe of do’s and don’ts. So lucky for me, I really like porridge. Any kind of porridge really, but with my recently discovered gluten intolerance, even my choices of porridge have been narrowed down. Before I moved to Seattle, I was basically living of off buckwheat porridge, and absolutely loved it. It was so easy and quick to make, top it with some dried fruits and nuts, and you had yourself a healthy and wholesome breakfast. However, I’ve been unable to find buckwheat flour in Seattle, like the kind we have in Denmark, so once again I’ve had to find something else to eat. One thing that I really love about this country though, is the fact that you can find pretty much anything in a gluten-free version. Granted, you’re paying a little extra for those products, but it’s still nice to have the freedom to cook “normal” meals gluten-free. I usually do my grocery shopping at either QFC on Broadway or Safeway on 15th, and both places have a good selection of both gluten-free and lactose-free products. I started buying GF oats from Bobs Red Mill (they have them at both supermarkets), and cook oatmeal for breakfast. It takes less than five minutes to make, and will keep you full for hours. This entry was posted on November 13, 2012 by Robin Avni in cohort 12 reposts + links, food + beverage, issue 5: food with thought, wellness and tagged breakfast, buckwheat, creative, dried fruits, food, gluten-free, oatmeal.